The Team Calendar in an expansion of the Personal Calendar and is used for managing and following the calendar of the entire team. The Team Calendar presents the schedule of the team members with live updates and modifications. The Team Calendar view is available according to the authorizations of the user. 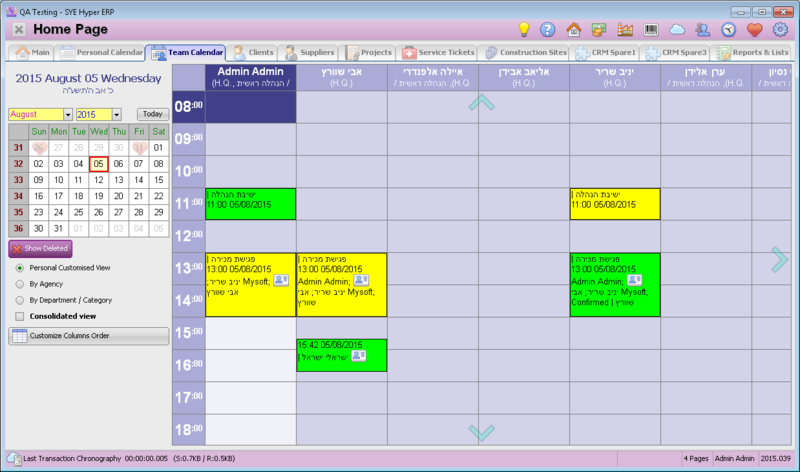 Personal Customized View - By using the Customize Columns Order the user can change the order of the employees in the display. By Agency - Dispaly the Calendar according to the required agencies. The user should choose the required agencies from the given list of agencies or choose the "consolidated view". By Department / Category - Dispaly the Calendar according to the required Department / Category. The user should choose the required Department / Category from the given list of departments or choose the "consolidated view". Personal Calendar of hte user - This field allows to view the personal calendar of any of the employees and managers on the list, according to the defined authorizations in the users employee card. If the user chooses the "Consolidated view for Agency" or "Consolidated view for Department", then the required ageny or department should be chosen from the list in this field. Show the deleted meetings (Cancelled). The deleted meetings will be presented as long as this button is active. Change the order of the employees in the display. Print the calendar according to the current dispaly. Each of the meetings squares presents some of the meeting fields as a preview. In order to choose the prefered fields for this preview, open the "Global & Basic Setting" label of the System Fundamentals. In the "Fields for Calendar Meeting Window" field, choose the required fields from the list. The length of the presented information is limited due to the preview window size.